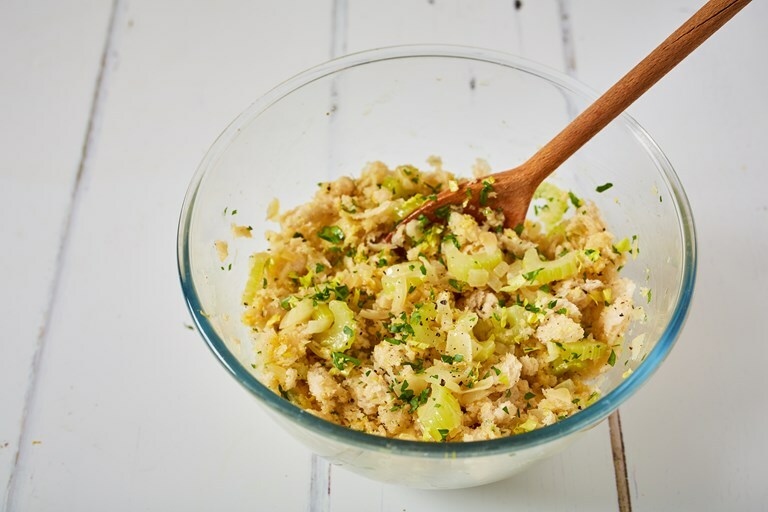 This celery stuffing recipe is quick and easy to make, saving you precious time when preparing a roast dinner. The aromatic celery combines with the savoury chicken or turkey juices to create a glorious fragrant stuffing that everyone will fight over. Take a look at Anna's other celery recipes here. This is the stuffing that my mum always uses at Christmas, so it has huge nostalgic value for me. There's something addictive about the combination of lemony butter and the green flavour of the celery. Add to this the breadcrumbs, that become slightly soggy from the turkey juices and crunchy where they have been exposed to the heat of the oven, and you have a cheeky and irresistible snack. Although, of course, it was not intended as a snack and I would often be told off by my mum for picking at the protruding stuffing before the turkey was served. Whilst researching my celery recipes I actually stumbled across this recipe in Jane Grigson's Vegetable Book, which must be where my mum's one originates from. This is her recipe with only one tweak from me, adding the celery leaves to the stuffing. This recipe is to stuff a turkey; if you are using a chicken than halve the quantities.